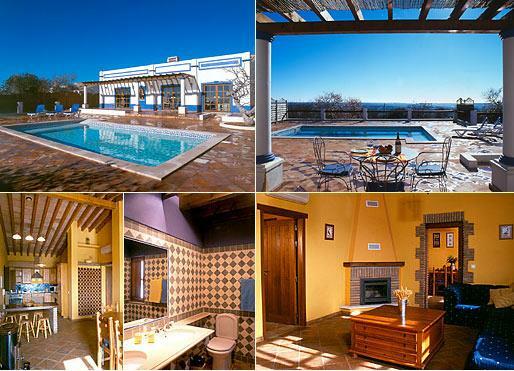 Fully air-conditioned and heated 3-bedroom cottage – Boliqueime sleeping 6 adults, comprising. 1 Double bedroom and 2 Twin bedrooms. 2 shower rooms with bidets, toilets and under-floor heating. Combined open plan kitchen and dinning room. Ample terracing around the pool. Excellent views to the south over Vilamoura and to the sea. Prices by request. Spacious two-level 4 bedroom villa located in a quiet residential area in between Praia da Oura and Albufeira “Old Town”. Ideal because it is about 15 minutes walk to “Fisherman’s Beach, or “Albufeira Strip” – full of nightlife. Ground floor: large modern kitchen & dining table area, lounge, 1 twin bedroom, full bathroom. First Floor: 2 double bedrooms (1 en-suite), twin bedroom, full bathroom. Garden area with pool and useful BBQ area for outside dinning. 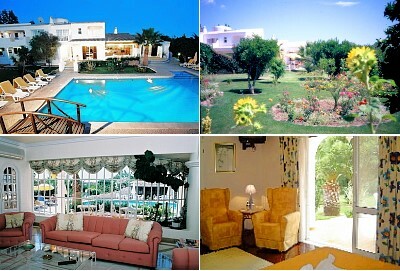 A two bedroom villa with private pool well furnished for holidays. Located on the west side of Cerro Grande with attractive views to the sea and Marina. The Albufeira “Old Town” is about 1 kms with its great selection of restaurants, bars & nightclubs. Its own entrance patio, living room, refurbished kitchenette, 2 bedrooms, 1-full bathroom and separate wc. Its own small sun terrace, swimming pool & BBQ. Casa Romantica has three bedrooms, 2 bathrooms, a shower room, private swimming pool, sleeps 6/8, Casa Romantica is a charming, traditional villa situated in the quiet residential area of Quintas Dos Alamos with very pretty cobbled streets, green areas and parks. A local bar and restaurant is within easy walking distance, but the village of Guia is famous for its numerous (25+) good value restaurants, also there is a daily fish, fruit & vegetable market and supermarkets. Guia is only 2 minutes from the villa by car or a 5-10 minute walk. Situated in Armação de Pera, just 10Km from popular Albufeira, this new 2 bedroom apartment is ideal for a perfect holiday. Only 500 metres away from the beach and within walking distance from bars and restaurants. It has a huge sun deck with country and sea views, 2 bathrooms, one en-suite, undercover parking, fully fitted kitchen. All the rooms are air-conditioned, tastefully decorated and very comfortable. Sleeps 8! Quinta Da Margarida has 5 bedrooms sleeping up to 10 people. Perched on a hill facing south with a panoramic view over the coast to the sea. A fine private home with modern comforts for all around the year living. A heated pool, plus tennis court and a lovely mature garden. Prices include 5 days of maid service per week. Only 20 minutes drive from Faro Airport and 5 kms to Vilamoura shops and golf and nightlife. 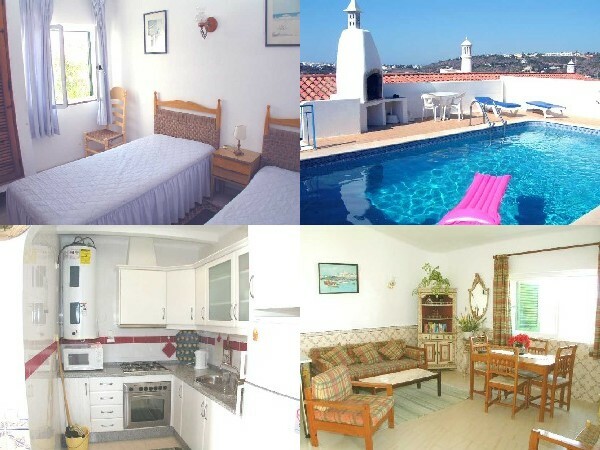 A spacious 2 bedroom bungalow style villa with private pool in the popular fishing village of Carvoeiro. Comfortably furnished and close to the main village square and its beach. The property is surrounded with a wall and shade by the pool area is provided by trees. There is a Hall, well equipped Kitchen, 2 twin bedrooms (one with en-suite bathroom), full bathroom, Lounge/dining with direct access to the patio, BBQ and pool area. Also a roof terrace with sea views. A large comfortable villa close to Carvoeiro – with 15 luxurious double bedrooms all with en-suite facilities and private terraces. Air-conditioning, central heating, satellite television, telephone and safe. A large comfortable lounge with ample space serviced by 24 hr. private bar. A weekly BBQ is available. In Quinta dos Oliveiras you will find the peace and tranquillity that you wish for in a holiday. Relax and enjoy our service which is known for its excellence. Your cosy Algarvian style town house in Lagos in a quiet street – set high up providing views across the town and the Marina, to the hills of Monchique, and out to the sea. The combination of being thoughtfully designed and owned by a interior designer gives this compact house a feeling of light and spaciousness. Ideal for persons seeking a quiet stay and at the same time the benefit of the town facilities that are within a very short walking distance. Quinta da Escócia is a comfortable private traditional farmhouse with 5 bedrooms and sleeps up to 10 people. Set in its own beautiful 100 acres of pine, eucalyptus, cork tree, and close to the very small village of Pincho. The wonderful fresh air scented from the trees and wild flowers. Complete privacy, seclusion and tranquillity hard to encounter. West Coast is 20 mins. drive with its long sandy beaches and Lagos is only 15 mins. Golf and horse riding are also close, and the house is safe and ideal for small children. Bookings only in periods of weeks from a Saturday to a Saturday. A recently built 3rd floor two-bedroom apartment located in a smaller complex in Vilamoura and within walking distance of beaches, shops, bars, restaurants and the popular Boat Marina. There are four single beds, one full bathroom, living/dining room, and log fireplace. There is a small terrace equipped with a B-B-Q with lovely views to the west over the Laguna Gold Course and to the sea. Sleeps 4 comfortably. A fully equipped villa and well furnished 4-bedrooms (sleeping 8) with 3 bathrooms in the exclusive Vilamoura with its Marina and 5 Golf Courses, Tennis, Bowls, etc. The villa with garden and pool is located in a quiet residential road close to local shops and near the Clubhouse of the Pinhal Course. The shopping centre/ marina are approx. 3km and the beach 4km. Casa Sulo is located to the north-east of Aveiro, in an idyllic village at the top of a mountain surrounded by eucalyptus forests and with great mountain views. There are two adjoining apartments, with each sleeping 6 people – one double and one twin bedroom plus a sofa-bed. Each bedroom is en-suite and with showers. Fully equipped kitchen with basic food items already awaiting your arrival. Located within the very centre of historic Viana do Castelo. Our charming 16th century Manor House refurbished in 1992, and decorated with family portraits and antiques. We have 10 individual bedrooms furnished in a traditional manner which provides a total of 18 beds. Central heating and air-conditioning, lounge, bar, library, conference room, Satellite TV and a lift. Open throughout the year. Our attractive home in the hills above Cascais is a mixture of the old with the modern. We Three different suites offer a choice to sleep from two to four people. Each air-conditioned, TV, DVD and Safes. There is a breakfast room and a comfortable lounge with TV. An attractive garden around the pool also has a BBQ area. Our location is ideal either to explore the historic areas of Sintra and Mafra, play golf, or, just sit on the beach. Casa Leonor is a traditional house in village of Zambujal de Baixo and close to beach town of Sesimbra – 36 kms south of Lisbon. Ideally located within easy reach of beaches, local restaurants and night life. Friendly owners make sure that Casa Leonor is the place to stay for your holiday and have comfortable 2 doubles, 1 twin, plus 1 family room sleeping 5 people. Laundry service – transfers from Lisbon airport – pets are welcome. Our 3-bed roomed villa is located in a cul-de-sac and only 1 mile from Sesimbra beach with local bus service. Comfortably furnished to sleep 6 people (+3 if needed) Large lounge with TV, DVD + CD player, and fully equipped kitchen plus washing machine. Enclosed garden with BBQ area. Lisbon is only 20 miles drive and 18 hole golf course is only 15 minutes by car. Great area to visit with lots to see and do.